JOHTO 156 At the End of the Full Battle! Respective Roads! !/Johto Photo Finish/フルバトルのはてに！それぞれのみち!! AG 11 A Bite to Remember/Graena and Pochiena! The Mystery of Evolution!!/グラエナとポチエナ！進化の神秘!! AG 30 A Meditite Fight/バトルガールとアサナン！嵐の中で！/The Battle Girl and Asanan! Within the Storm! AG 33 Now that's Flower Power!/A Rival for Haruka! Pokémon Contest Training!!/ハルカにライバル！特訓ポケモンコンテスト!! AG 35 Haruka! Her First Try at a Pokémon Contest!!/ハルカ！ポケモンコンテスト初挑戦! !/Win, Lose or Drew! AG 52 Cheer Pressure!/プラスルとマイナン！応援の道! ?/Plusle and Minun! The Field of Cheering!? AG 63 ソルロックとハスブレロ！聖なる森の伝説！/Solrock and Hasubrero! The Legend of the Holy Forest! !/Takin' the Lombre Home! AG 68 A Double Dilemma/パパはアイドル!?いつわりのジムリーダー! !/Papa is an Idol!? The Fake Gym Leader!! AG 74 Hokey Pokeballs!/Fushigidane and Fushigidane! Recover the Monster Balls!!/フシギダネとフシギダネ！モンスターボールを取り返せ!! AG 77 A Formidable Enemy!? Enter the Coordinator Mama!/強敵! ?ママさんコーディネーター登場！/A Fan with a Plan! AG 86 映画はバクーダに乗って! !/The Movie Rides on Bakuda! !/Lights, Camerupt, Action! AG 117 A Wild Battle and a Wild Mess! The Kinagi Tournament Pokémon Contest! (Part 2)/混戦、混乱！ポケモンコンテスト・キナギ大会！（後編）/Pacifidlog Jam! AG 127 Saved by the Beldum/予備選スタート！マサムネ登場! !/The Preliminaries Start! Enter Masamune!! AG 152 My Rival is an Office Worker? !/Weekend Warrior!/ライバルはサラリーマン!? AG 167 摩天楼の赤いイナズマ！/The Red Lighting of the Skyscraper!/Curbing the Crimson Tide! DP 30 Hakutai Forest! Minomucchi Evolution Tactics! !/Some Enchanted Sweetening/ハクタイの森！ミノムッチ進化作戦!! DP 134 Promoting Healthy Tangrowth森の王者！モジャンボ！！The Forest King! Mojumbo!! DP 162 Playing the Performance Encore!ダブルバトル！VSプラスル・マイナン! !Double Battle! VS Plusle・Minun!! DP 168 Keeping in Top Forme!飛べシェイミ！空の彼方へ！！Fly Shaymin! Beyond the Sky!! DP 176 Coming Full — Festival Circle!セミファイナル！決勝へ進むのは！？Semi-Finals! Who will Advance to the Finals!? X Es bevorzugt feuchte Orte. Am Tag sitzt es regungslos im Schatten des Waldes. Von seinem Kopf sondert es einen giftigen Puder ab. X Il préfère les endroits humides. La journée, il reste à la lisière de la forêt. Il libère de la poudre toxique par sa tête. X Prefiere los sitios húmedos. De día está tranquilamente en el bosque, a la sombra. Expulsa polvo tóxico por la cabeza. X Predilige le aree umide. Di giorno resta immobile nell’ombra della foresta. Dal capo rilascia polvere tossica. X 습한 장소를 좋아해서 낮에는 숲의 그늘에서 가만히 있다. 머리에서 독가루를 뿌린다. Y Es setzt an seinem Kopf Giftsporen frei. Werden diese eingeatmet, verursachen sie Schmerzen. Y Le sommet de sa tête libère des spores empoisonnées. Il est dangereux de les inhaler. Y Lanza esporas venenosas desde la parte superior de la cabeza. Inhalarlas es muy doloroso. Y Sparge spore tossiche dalla sommità del capo. Se inalate, queste spore provocano dolore in tutto il corpo. Y 머리의 정수리에서 독 포자를 뿜어낸다. 포자를 들이마시면 몸의 마디마디가 아파진다. Omega Ruby If Shroomish senses danger, it shakes its body and scatters spores from the top of its head. This Pokémon’s spores are so toxic, they make trees and weeds wilt. Omega Ruby Wenn Knilz Gefahr wittert, schüttelt es seinen Körper und verteilt Sporen von seinem Kopf. Diese Sporen sind so giftig, dass Bäume und Gräser davon eingehen. Omega Ruby Lorsque Balignon sent un danger, il secoue son corps et répand ses spores du haut de sa tête. Les spores de ce Pokémon sont si toxiques qu’elles font dépérir les arbres et les herbes. 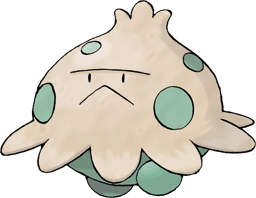 Omega Ruby Si Shroomish siente peligro, agita el cuerpo y libera esporas venenosas por la cabeza. Estas esporas son tan tóxicas que pueden hacer que se marchiten los árboles y hasta las malas hierbas. Omega Ruby In caso di pericolo Shroomish agita il proprio corpo spargendo spore dalla sommità del capo. Le spore di questo Pokémon sono così tossiche da far appassire fiori e piante. Omega Ruby 위험을 느끼면 몸을 흔들어 머리의 정수리에서 포자를 뿌린다. 풀과 나무가 시들 정도의 맹독이다. Alpha Sapphire Shroomish live in damp soil in the dark depths of forests. They are often found keeping still under fallen leaves. This Pokémon feeds on compost that is made up of fallen, rotted leaves. Alpha Sapphire Knilz lebt im feuchten Erdboden finsterer Wälder. Es wird oft reglos unter herabgefallenen Blättern gefunden. Dieses Pokémon ernährt sich von Kompost aus verrotteten Blättern. Alpha Sapphire Les Balignon vivent dans les sols humides et les recoins sombres des grandes forêts. On les trouve souvent immobiles sous les feuilles mortes. Ce Pokémon se nourrit d’un compost fait de feuilles mortes pourries. Alpha Sapphire Los Shroomish viven en zonas húmedas en la profunda oscuridad del bosque. Suelen quedarse tranquilamente bajo las hojas caídas. Se alimentan del abono que estas generan al empezar a pudrirse. Alpha Sapphire Shroomish vive nel suolo umido nel cuore della foresta buia. Spesso si nasconde sotto le foglie cadute. Si ciba dell’humus creato dal letto di foglie decomposte sul terreno. Alpha Sapphire 깊은 숲의 축축한 땅에 서식한다. 낙엽 밑에서 꼼짝하지 않고 있을 때가 많다. 낙엽이 쌓여 만들어진 부엽토를 먹는다. Ruby Shroomish lives in the dark depths of forests. They are often found keeping still under fallen leaves. This Pokemon feeds on the compost that is made up of fallen, rotted leaves. Sapphire If SHROOMISH senses danger, it shakes its body and scatters spores from the top of its head. 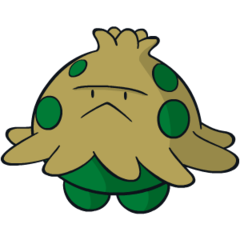 This POKeMON's spores are so toxic, they make trees and weeds wilt. FireRed It prefers damp places. By day it remains still in the forest shade. It releases toxic powder from its head. LeafGreen It prefers damp places. By day it remains still in the forest shade. It releases toxic powder from its head. Emerald It loves to eat damp, composted soil in forests. If you enter a forest after a long rain, you can see many SHROOMISH feasting on composted soil. Pearl It spouts poison spores from the top of its head. These spores cause pain all over if inhaled. Platinum It spouts poison spores from the top of its head. These spores cause pain all over if inhaled. SoulSilver If it senses danger, it scatters spores from the top of its head to protect itself. White It spouts poison spores from the top of its head. These spores cause pain all over if inhaled. Black 2 It spouts poison spores from the top of its head. These spores cause pain all over if inhaled. White 2 It spouts poison spores from the top of its head. These spores cause pain all over if inhaled.